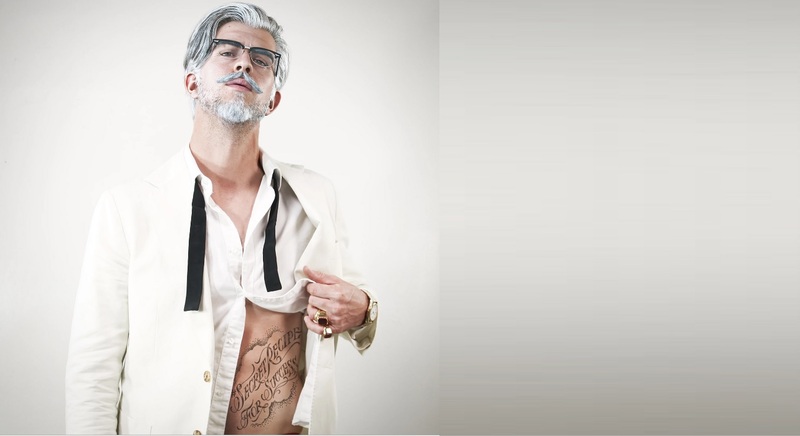 For its new spokesperson gig, KFC creates virtual tattooed influencer Colonel to poke fun at the Instagram era. “Basically, I am an international mogul turned virtual person who wants to inspire the world with my amazing life,” asserts KFC’s latest spokesperson. Lately on the Gram, every influencer and brand seeks fame laced with the intention to Inspire with a capital “i”. But it’s not the encouragement to “always try to inspire like I do when I’m making amazing fried chicken.” that’s so unusual. Instead of hiring a spokesperson, KFC creates a virtual tattooed influencer Colonel who totally looks like a Hemsworth. His grey hair is expertly coifed. His accessories are as modern as the cut of his iconic suit, shirt and tie. Even the eyewear is on point. His sculpted stomach wields a serious tattoo reading “Secret Recipe for Success” that coordinates with his hashtag #secretrecipeforsuccess. He travels the world, has a girlfriend who strikes poses with him on the beach, chills with horses that help him feel “so connected to nature” while in Kentucky, loves collabs and digs disruptive business development. This campaign arises as sponsored posts and other influencer marketing greatly increases. In 2018, Instagram saw 2 million sponsored posts be published according to Klear, a social media and analytics platform. Plus, some brands are starting to turn away from mega-influencers who don’t seem to convert to actual sales, they’re finding that nano and micro-influencers with followings ranging from 800 to 50,000 are more effective to targeted and trusted connection. Yet, KFC has avoided this guessing game for finding their audience by leaning into the uncanny valley. It begs to question, will even influencers eventually be replaced by AI? The virtual Colonel is doing an Instagram takeover of the food chain’s account now until April 22.